Tofu: What Is It and Where Does It Come From? Brains at the ready please, as we prepare to take you back over 2,000 years to the very origins of tofu. Although opinions do vary about the origins and history of tofu, there is no disputing the fact that it is at least 2,000 years old. 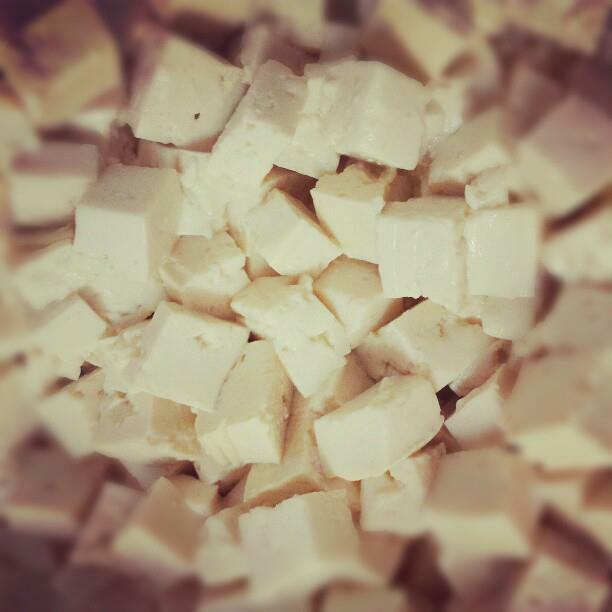 The general consensus is that tofu originated in Han Dynasty China. It is rumoured that tofu was the brainchild of Prince Liu An of Huainan, grandson of the founder of the Han Dynasty and a top scholar and author. Over the next 500 years or so tofu was introduced into Korea, and then Japan at some point between the years 710-794. I’ve heard of tofu, but how is it made? The majority of you will know tofu as a meat substitute for vegetarians, thanks to its low calorie count and comparatively large amounts of protein. It can also be high in iron, calcium and/or magnesium, although the way it’s made does differ and this can affect the tofu’s mineral content. The main ingredients in tofu are soybeans, which are soaked in water before being milled. This transforms the mixture into a raw soybean soup. The liquid is then boiled and separated, leaving soy milk and a soy pulp, otherwise known as okara. The soymilk then goes through a rigorous process of coagulation, pressing and molding, before being immersed in water and chilled. How is tofu used in Japanese cuisine? The English term tofu originates from the Japanese tōfu, which has been borrowed from the Chinese equivalent. There are specifically two types of dried tofu produced in Japan, which are usually rehydrated in water prior to eating. For those of you who have had your fill of fish, or the vegetarians amongst you, tofu can be an incredibly tasty treat, particularly when served up in some of the delicious concoctions common to sushi delivery restaurants in London and beyond. One popular sushi takeaway dish is the mouth watering vegetable katsu curry, which incorporates crispy bread crumbed tofu, potatoes, carrots, baby corn, courgettes, butternut squash and broccoli, and is garnished with pickles and soybeans. In this dish, the tofu is chopped into cubes, lightly coated with breadcrumbs and fried. Can you make your own tofu at home? If you’re feeling particularly adventurous, then yes, you certainly can, but bear in mind that it’s difficult to replicate the quality of tofu available in sushi takeaways and other specialist London stores. All you need are some dried soybeans, about 1-2 cups worth, and the coagulant “Nigari” also known as bittern or magnesium chloride. And here are some easy to follow instructions. Happy eating! This article was posted in Healthy Eating, Sushi FAQs, Try Something New. Bookmark the permalink.